Most discussions of Philippe Claudel’s fiction eventually identify Kafka as a likely influence, some even describing his narratives as “Kafkaesque.” If anything, The Investigation, the most recent of Claudel’s books to be translated into English, makes it unmistakably clear that such comparisons are entirely accurate, but it might also prompt us to consider the implications of the comparison more carefully. Kafka’s undeniable greatness aside, why, after almost 100 years, would a novel that so obviously duplicates the most familiar features of the Kafkaesque, that so obviously wants to be Kafkaesque, also still want to be regarded as somehow original and daring? Claudel’s books have certainly been received as if simply by evoking Kafka (also Beckett) they deserve to share the high regard with which Kafka’s work is generally held, and if resemblance to a story Kafka might have told is a legitimate criterion of judgment, The Investigation might indeed deserve acclaim. A man known simply as “the Investigator” has been assigned the task of assessing a recent spate of suicides at “the Enterprise,” an all-encompassing but shadowy operation that, as the Investigator discovers, is involved in just about every form of human activity, and might be the ultimate source of all such activities. He meets other figures given similarly emblematic cognomens: The Giantess, from whom he has to beg a room after his initial rebuff from the Enterprise (or at least its Guardhouse), the Policeman, the Guide, the Watchman (these latter two the same person performing different jobs), the Manager, the Psychologist. All of these characters serve as obstacles to the Investigator in completing his task (which in fact never really begins). The Enterprise itself proves to be more or less impenetrable, the Investigator’s repeated efforts to gain access to its mysterious authority resulting only in his own gradual enervation and increasing despair. Claudel’s borrowing of the allegorical markers we associate with Kafka — the universalized protagonist, the enigmatic, impalpably threatening environment — could not be more blatant. The story of the Investigator’s deflected attempts to penetrate the security apparatus and the accumulated bureaucratic layers of the Enterprise mirrors the similar attempts of the protagonists of The Trial and The Castle, and it seems unlikely that many readers of The Investigation would miss these parallels. Because we know that in a properly Kafkaesque tale at best only irresolution will result from the protagonist’s efforts, there really is no suspense, no surprising plot turns, no real character development in the novel, so that it would seem the main focus of interest is reduced to noting the way in which the imitation of Kafka is carried through. To be influenced by Kafka’s allegorical strategies and his vision of the dehumanizing conditions of modern life is one thing, but to essentially simulate a narrative of the kind Kafka might have written does not seem an especially venturesome move. If The Investigation adds anything at all to the aesthetic strategy inherited from Kafka, or provides some ultimate surprise, it is through situating the narrative in a context that takes it beyond the dreamlike aura conveyed by Kafka’s fiction, all but “baring the device” in its suggestions that the Investigator is not living out a nightmare but is living in a fiction, that both he and the world in which he is caught are ongoing creations of an author whose presence the Investigator at times senses but who otherwise remains concealed. This metafictional conceit is actually most visible — to the reader at least — in what seems to be the carelessness or incompleteness of the creation: Taxi cabs are there one minute and gone the next; crowds of almost literally faceless people move in uniform directions on opposite sides of the street; weather changes from summery to snowy in a single day. The Investigator seems to inhabit a fiction not much interested in specific detail, whose particulars are few, the minimum necessary to sustain the allegorical narrative but apparently of little concern in themselves. At the novel’s conclusion, its status as metafiction is confirmed. The Investigator finds himself in a twilight zone full of containers, inside each of which are what can only be taken as discarded characters, never again to be released from their confinement. He confronts “the Shadow,” who conjures up the Investigator’s own demise, leaving him finally a “very clear image of slow dripping and the soothing music it produced, soon covered by the sounds of sheets of paper being torn up and then burned, and the faint whisper of ink poured out onto the pages of a book.” The Investigator’s coffin is sealed with the “click” of a laptop computer being closed. One could say that the metafictional framework within which Claudel relates his Kafkaesque narrative leaves an impression it is more thoroughly crafted than most of Kafka, but in my view it really only reinforces the conclusion that the novel is not at all original but derivative, both of the fiction of Kafka and of the work of those postmodernists whose self-reflexive fictions inspired the widespread use of term “metafiction” to describe them. These writers are primarily American — among them John Barth, Robert Coover, Gilbert Sorrentino — so perhaps we could say that Claudel’s innovation is in allying the modernism exemplified by Kafka’s parables of alienation with the postmodernism of the initial wave of metafictionists, except that some such adaptation of the various departures from realism prominent in 20th century fiction can be found in much current European fiction. To the extent that The Investigation can plausibly be taken as representative of European fiction (as conceptualized in, for example, Dalkey’s Best European Fiction series), claims that this fiction is inherently more experimental and adventurous than American fiction overlooks the fact that it is heavily indebted to American fiction for bringing widespread attention to the possibilities of “fiction about fiction” as a logical extension of modernism’s challenge to conventional storytelling. That this debt goes largely unacknowledged suggests that writers such as Coover and Sorrentino, as well as even lesser-known metafictionists such as Ronald Sukenick and Raymond Federman, are sufficiently unknown or undervalued that what they began doing almost half a century ago remains invisible to writers and critics for whom the concept of metafiction belatedly seems an audacious idea. 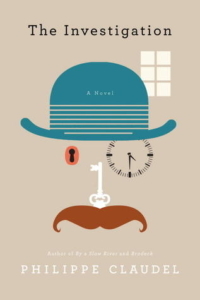 The Investigation perhaps works best as a kind of mystery story, but unlike Kafka’s fiction, in which the mystery is ineffable, its solution impossible from the start, in this novel the mystery is solved after all, and all too conveniently. Claudel uses the devices of metafiction not to question traditional storytelling, to provide an alternative to it, but ultimately to reinforce it. The Investigator’s discovery that he is a fictional character provides the novel with a clear and complete resolution of the sort we would never find in Kafka. Perhaps this would make the novel mildly entertaining for readers who take their postmodernism in its most homogenized form, but while The Investigation certainly does feature a few darkly amusing scenes in its chronicle of the Investigator’s travails, anyone interested in what adventurous fiction looks like after the inspirations of modernism and postmodernism have been assimilated will probably find it a disappointment.